Wireless Reading Device, Do You Need One? Wireless Reading Device - Do You Want One?! Regardless of the name, a wireless reading device, as the name suggests, has a specific intended use; reading books! But lets not be fooled. With today's technology and innovation, what we call a wireless reading device will surely have much wider and exciting applications. It's hard to imagine a device of this nature only doing one thing, particularly given the price. Why Would You Want An eBook Reader? You might be asking yourself why you would even want an ebook reader? I'm not going to go into any details comparing ebooks to physical books. I assume that having used a computer to surf the Internet, which ultimately brought you to this site, that you can contemplate the benefits of having access to thousands of books on an electronic reading device, versus the comfort and pleasure of reading an actual paper book that doesn't require batteries. The screen on most of these devices is designed specifically for ease of reading. They're typically black text on a matte white background (i.e. not glossy or bright). This tends to make reading easier on your eyes than a typical computer screen, as it is meant to look more like text on paper. Note, however, that as full fledged tablet computers become more and more popular doubling as ebook readers, the debate starts regarding whether a device built mostly for reading is a better choice than a multi-purpose tablet. Because the device doesn't have to run fancy graphic intensive applications, or run numerous programs at once, the processor can be much slower, which means that it draws less battery power. This, along with the different screen quality will give you much much much longer battery life than if you were using another computing device. These devices are much smaller, thinner, and lighter than most computers, or tablets you're going to find out there, which makes it more comfortable to sit in your favorite chair, or lie down on your bed or couch to read your book. Reading on a tablet-shaped device is going to be much more comfortable than a standard fold-up computer design. Even a tablet PC that will allow you to rotate the screen will be much heavier, and have the same battery life and readability issues as a standard computer. That said, as tablet computers become increasingly thinner and lighter, this advantage starts to disappear. A wireless reading device is specifically designed for reading electronic books, and hands down will provide you a better experience than reading on another computer device. Everything about it is designed for reading, from how you navigate the device to how you turn pages. Quick, easy, and simple! So would I buy one, no. Personally, I don't do enough book reading. I'd rather have a full fledged tablet and use it for reading (using the Kindle or other app), however, I can see why avid novel readers would not feel this way. You might be asking yourself why these are in the wireless category? It's simple really. You could download books on your regular home computer or laptop and simply upload or transfer them to your reading device, however, in this day and age, that's just not acceptable! People simply wouldn't tolerate a non-connected (to the Internet) device that requires transferring books between computer and device; what a pain. WiFi - Typically free Hot Spots or home wireless networks that allow you to connect to the Internet to download your electronic reading material. Mobile Broadband - Runs on one of the large wireless carriers (ex. Verizon, AT&T, Sprint) allowing anywhere, anytime access to download digital materials. Broadband cellular connectivity will come with a higher equipment price tag, as it requires a more expensive wireless chip. It also may require extra cellular data access fees depending on the device. Generally speaking, if you want the most options available to you, you'll want to get the broadband version (which also usually includes WiFi). You can always choose not to purchase broadband service. Though if you don't mind dealing with another add-on device, a MiFi Hotspot is actually the most versatile option that you can use with your other devices. The greatest challenge to getting the mainstream population to buy a wireless reading device is the cost. 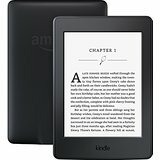 When the initial Amazon Kindle launched it really was a fairly costly device, which made people think more carefully about whether they'd be better off just using their regular computer, despite the drawbacks discussed above. But prices quickly came down. However, then came inexpensive netbooks and tablets. Some will still debate which approach is better, but ultimately it will depend on the price, and your habits and preferences. If you really do a lot of reading, one of these dedicated ebook readers is definitely going to be a good option for many to consider. You might be asking yourself what a wireless reading device has to do with prepaid wireless, which is the whole point of this site! Well, because the only way to get access to your electronic content anywhere, anytime is to have a cellular connection, they're intrinsically tied to wireless carriers. Some devices don't charge any additional fees for wireless access, while others do, especially ones like the Apple iPad, which is a great Web surfing device. Carriers will choose from, or offer two options: One being charging you less for the device via a Handset Subsidy, and locking you into a data service plan with a contract. The other being a prepaid program where you pay full price for the device, and buy data on a pay as you go or monthly basis. So as you can see, it does relate, and you know which option I would recommend!